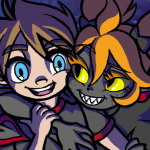 I think you’ve all been pretty patient, and I can’t wait any more… so here’s the new page a little while early! So, without further delay, meet Shadow! I’m really hyped to see where this goes but good lord, I REALLY wish you could find time to put more than one out a week…. You’re not alone in that boat, we all wish for that. It’d be awesome if it could be three times a week. At BEST it’d be 2 updates a week, one on Wednesday or Thursday, and one on Sunday… of course, I’d have to seriously push myself to keep that schedule up, and limit everything else. It’s best to keep things as is, don’t over work your self just cause we want more pages a week. You should practice some calligraphy bruh, does wonders for your drawing speed. Damn, looks like 300 comments will be just out of reach. This comic need more eyes on it. I posted an update on my facebook profile. Lets see if the comments get higher. I just hope the prunes stay away. What’s your DA profile? I’d like to see what you’ve posted there. PETPEEVE MODE ENGAGED! DEAR GOD SOMEBODY KILL ME! Haha, yes. She doesn’t normally wear anything on her legs at all. And I see your stressing the normally, so she will be at some point in the future? Eh? No. She’ll be barefoot almost 99% of the time, now and in the future. None of the Monster characters wear shoes, although some bind their feet in wrappings; leaving the claws exposed, of course. She’s wearing a dress… right? Wait, did u just hint at more monsters later on in the story? Other Monster characters? Of course! There’s (redacted by poster), (redacted by poster), (redacted by poster) and even (REDACTED BY POSTER)! Yes, even HER! And of course, the wicked, deliciously evil [REDACTED]! Ohhh! what a thorn in Tim’s side… or should I say shoulder? The only thorn worse than THAT one would be Damien Thorne. I see what you did there with the pain in the shoulder, at this rate I’m going to die of anticipation!!! Yes, I myself have taken a ride on the hype train many times myself, so I’m hip to your feeling! I wonder if guest has created his account yet? Yes, It`s me, sorry for the delay. Yahoo has upped their security, so I can`t make a new account without a phone number there (and I had thought that it`s because the the low-tech that they did it, although it might just be an anti-linux thing) I had finally got on a desktop (with linux (Lubuntu)) and am still waiting for confirmation for the account at Yandex. Phreaking and anime works together, no? The GuP reference (I was surprised that no one had watched this anime) is actually an acronym. Yes, I noticed Yahoo has upped their security and you now require a cell phone to get an account. So no business of mine will they get. And the account is activated. Anyone cares for a drought of paranoia amidst the Snowden age? Or perhaps an éclair of WWII-era tanks, all lined up? Or… just some good old posts from the Linux PC? Don’t remind me! XD I’m a bit behind schedule as is. but this comic making is hard work, its almost as hard as it is to go and fish in a big lake. patient is the key my friend. Indeed, I do upload every Sunday (not always at midnight!) and it can be quite hard work sometimes. Depends on how many panels there are and how complex each panel is. 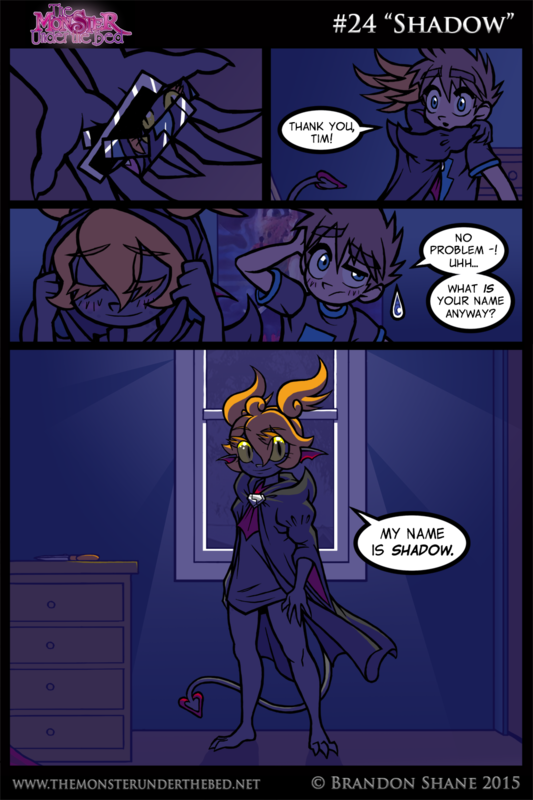 For instance, this week’s page has 6 panels, Tim appears 4 different times and Shadow appears 5 times at different angles. There is a perspective shot this week which I’ve tried not to louse up too badly which kinda slowed me down a bit trying to figure out. Yay We Final found out her Name YAY it Shadow!! According to http://www.thebackalleys.com/love/ , Tim and Shadow are only 12% compatible. Yikes. Good luck to Tim. Yeah, yeah. Cliché. I know. … When I think of ‘Shadow’ as a character name, I automatically add ‘the Hedgehog’ to it mentally. Blame me playing the hell out of the gamecube game when I was younger. I actually never got into any of the 3D Sonics, so I never had that connection. Of course I knew of the character beforehand, but there are several prominent ‘Shadow’s’ in pop culture to me. Nevertheless, Shadow seemed to fit her anyway. Four pages of comments now?